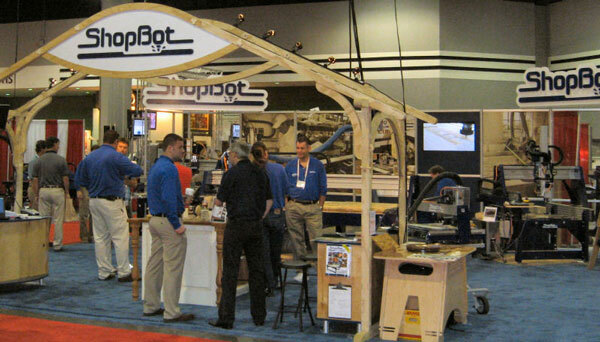 We certainly had no complaints about IWF for ShopBot. 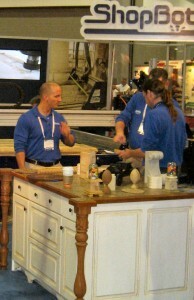 Our booth was frequently crowded with people watching our tools in action. We were probably the only vendor that had 5 CNC tools almost continuously cutting. Granted, attention did tend to wane a bit when, once-an-hour, they slammed the hotdog into the table-saw blade in the SawStop booth next door. 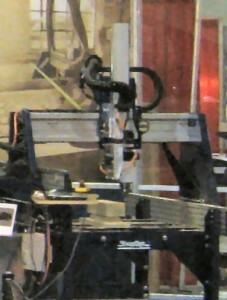 The centerpiece of our booth was one of our new PRS-108 format (9ft x 5ft) ShopBots that loads from the wide side. The tool takes advantage of our extruded beam (custom made for ShopBot by Bishop-Wisecarver with integral, precision, hardened rails) to create a wide gantry that conveniently opens the work area when it is moved to the back of the tool. For the show, this ShopBot was fitted with an automatic tool changer (ATC) and vacuum hold-down as well as an indexer for turning and carving. The indexer was located just beyond the regular 4×8 work area at the far end of the tool. These options make for a pretty expensive tool as ShopBots go – but an awesome cabinet-maker’s package in terms of its wide range of capabilities. During the show we demonstrated cutting parts for a kitchen island that included base cabinets, drawers and accessories, shaped, MDF doors, and carved legs – all done on this one machine. We also showed a ShopBot Buddy CNC. 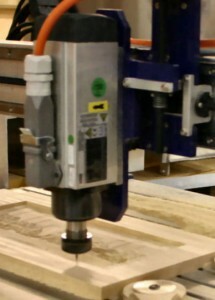 ShopBotters have been making use of the small-footprint Buddy CNCs for an increasingly wide range of production projects, from specialized drilling, machining or shaping to joint-making and trimming operations. 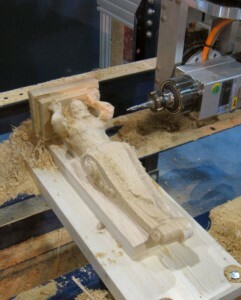 We brought a Buddy to the show that was fitted with an indexer for carving. We produced table legs with carved features to illustrate how a CNC indexer affords a much wider range of intricate carving than simple shaping and ornamental turning. Note that you can slide the indexer deck out of this tool and slide in its standard table whenever you want to go back to CNC routing. IWF marked the official introduction of our “Desktop” ShopBot — the result of our open “Tyro” development project featured in the fall and winter on our website. We took a number of orders for this small tool which starts shipping October 15th. The two Desktops we brought to the show cut and carved (many from the VectorArt3D collection) for the entire 4 days of the show making very smooth samples that seemed to keep “walking off”. On one day of the show, one of these Desktops was used for a WoodLINKS teacher education program. We’ve spent the year developing the Desktop ShopBot and have involved ShopBotters in the design and prototyping of the tool. 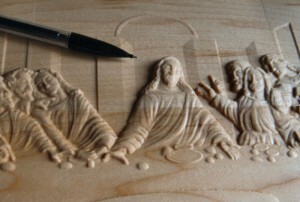 As well as having impressive woodworking capabilities, the tool also has engraving-level precision and will machine parts from plastic, aluminum, and other materials. Its ready for a wide range of workbench and prototyping project. 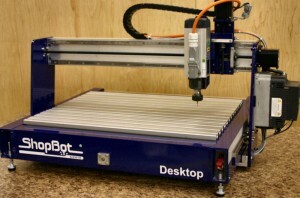 The Desktop runs ShopBot software and ships with the PartWorks design programs (developed for ShopBot by Vectric), so it’s fully compatible with other ShopBots and all ShopBot resources. Our new 5-Axis ShopBot also attracted attention. This tool takes advantage of standard ShopBot modular components, adding a 2-axes head on the end of the Z-arm that creates wrist-like movement capabilities. We brought a small version of the tool to the show, but the 5-axis head can be fit to any size PRSalpha ShopBot with an extended Z. I expect the typical version of the tool will have a 2’ x 2’ x 2’ work envelope and be priced well under $50K – this makes it remarkably low-priced for 5-axis CNC capabilities. Because of the long Z extension, the tool does not have the stiffness for heavy machining work but will be very well suited to general carving, trimming, and prototyping as well as to operations that require drilling or machining from unusual angles. 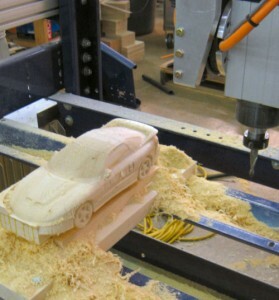 At IWF, we carved wood corbels and model TransAms with the tool. We did the CAM work for these 5-axis projects with RhinoCam, which is a straightforward and affordable software for 5-axis CAD/CAM work from MecSoft. Over the next few months we’ll be posting information on the website about 5-axes. 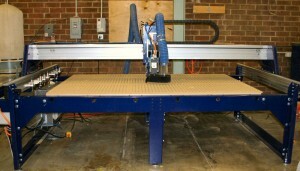 If you need a tool sooner, give ShopBot a call (919 680-4800) and ask to speak to Gordon about 5-axes. We sold a number of ShopBots at the show and from that perspective it was a worthwhile trip for us. But beyond making sales, we were pleased to have received the “Industry Partner Award” from the WoodLINKS Program for our involvement and contributions to WoodLINKS on both the local and national levels. 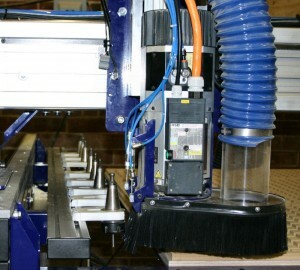 Along with many other woodworking machinery and woodworking products companies, we have worked hard with WoodLINKS and to spread the word about the importance of CNC and robotic technology in bringing production back to the US. We are particularly enthusiastic about the way WoodLINKS provides training and resources for the faculty and teachers doing the real work of bringing hands-on education to today’s students. We at ShopBot strongly believe in the importance of creating new training options for careers that will involve technology, creativity, and productivity; alternatives to the standard liberal arts course track or service industry orientation of many high school and tech school curricula. We like to communicate that this type of training is not so much about teaching how to run specific CNC or woodworking equipment but is about getting people involved and understanding technology, machines, and the making of stuff – providing the general familiarity that will allow to adaptation to rapidly changing capabilities and creating excitement with the building, producing, and manufacturing of things. Despite our own good vibes, general participation and attendance at IWF made it clear that the economic rebound (to the extent it exists) has not yet come to woodworking. Official attendance figures are not in, but rumor has it that only about 11,000 woodworkers attended the show over the 4 day period. This is about a third of what it was 4 and 6 years ago and barely half of the woodworkers in attendance just 2 years ago. The absence of a positive trend compared to 2008 made things seem even more depressed than AWFS in Las Vegas last year, where attendees still seemed to share some hope for a rapid rebound in woodworking activity. There was a notable lack of woodworkers wandering the aisles marveling at the latest new machine capabilities … in fact, the show aisles were often deserted. Attendees at the show seemed to have come to get a few of the things they needed and were grimly shopping in an atmosphere of toughing things out. For us, this meant that there was a focus on CNC and on the use of automation in ways to make small shops more efficient – so I shouldn’t be too negative. And along those lines, Ralph Bignall’s (Consulting Woodworker) lecture session on integrating “Lean” and CNC into small shops was well attended; Ralph gave us permission to reprint the useful summary of his session and main themes, which you can find with other materials on Ralph’s website. But the good news for CNC was an exception at this show. This sounded like a good event to us and because we produce ShopBots here in North Carolina and are one of the largest producers of CNC routers in the US, we asked to participate in the event. We were turned down. However, we would like to invite everyone who will be in the area for NexGen to also visit our factory here in Durham during their stay. We’re near the RDU Airport and we’ll be providing demonstrations, short training sessions, and production consulting. We believe that many woodworking operations are looking for alternatives to heavy, traditional, capital-intensive equipment. We’d like to show how our tools offer lean, efficient, alternative production (LEAP) methods for woodworking automation that can be flexibly integrated into a range of lean and cellular manufacturing processes. LEAP equipment may be appropriate for your production challenges. New manufacturing approaches now emphasize the importance of adaptive, agile, human-scaled automation equipment that supports rapid process re-organization rather than locking operators into expensive machinery around which an enterprise must be organized. Instead of becoming chained to another generation of heavy, specialized equipment that locks a company into a particular set of methods, we look forward to showing woodworking managers how companies such as Wood Mode, Master Brand, and Kimble Office furniture integrate LEAP technologies that can be rapidly re-configured and utilized in adaptive ways as production demands change. So we will look forward to welcoming NexGen visitors to ShopBot. In short, the “Bad & the Ugly” in Atlanta was finding IWF in about the same rut as AWFS last year. The reality is that woodworking is a business heavily dependent on residential housing. 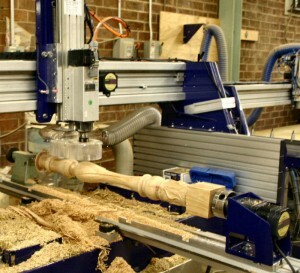 At some point, as remodeling and then housing pick back up, woodworking business will improve. But it will be quite a while before the boom/bubble that was in play at IWF 6-8 years ago returns. If you have followed earlier posts in my web column here, you will appreciate that despite this pessimism regarding an early recovery of general cabinetmaking and woodworking, I do believe there will be new niches and opportunities for digital fabrication and woodwork more broadly and with these we will see new types of production and manufacturing moving back into our communities. Iwould like info on this products and others of shopbot. I am looking for a complete machine (no suprise) add on this add on that. I am a artisan 60 years old not a millionnaire works out my garage.